What’s a tracking cookie and why do I need to block them? We’ve all had the experience of seeing ads change based on browsing, even across multiple websites. These ads are often for things that you have no interest in purchasing, but the economics of the internet make it easy to cast a wide net cheaply. Maybe this seems like no big deal, but we think that you should have a say in how this data is used. After all, it’s more than just an annoying pair of shoes following you around, it’s data that can be used to subtly shape the content you consume or even influence your opinions. At Firefox, we believe in giving control to the people, and hence giving users the choice to block third-party tracking cookies and the information collected in them. 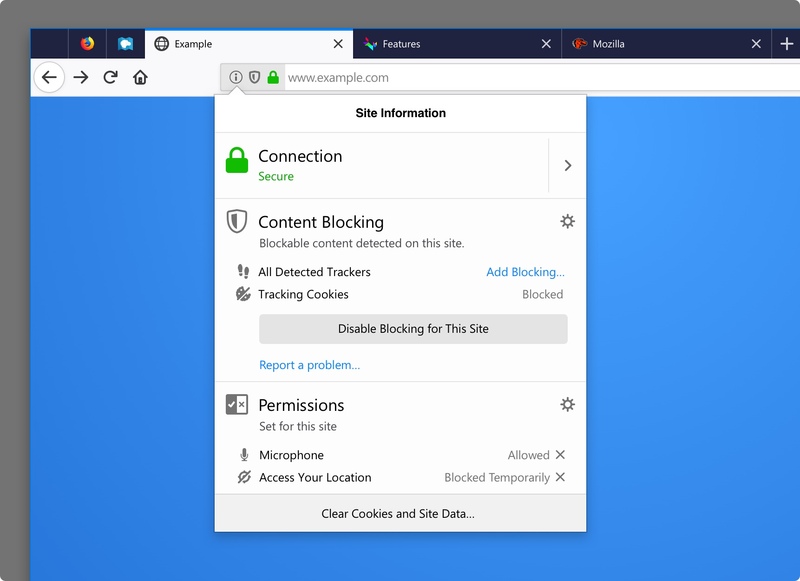 With today’s Firefox release, users will have the option to block cookies and storage access from third-party trackers. This is designed to effectively block the most common form of cross-site tracking. You might see some odd behavior on websites, so if something doesn’t look or work right, you can always disable the protection on a per site basis by clicking on the Shield Icon in the address bar, and then clicking “Disable Blocking For This Site”. We’ll continue to test this feature and hope to release it by default early 2019. Developers and site owners can read about the specifics of the functionality here. Search Shortcuts – First, we know people primarily use the web to search for information. Second, who doesn’t love saving time to get to the places they want to go, like taking city local streets instead of back-to-back freeway traffic? We combined these two to bring you Search Shortcuts. We pinned the top two sites people use to search, Amazon and Google, to the New Tab page. Currently, this will only be available in the US. To learn more about this feature visit our Firefox Frontier blog post. Adapting to your Windows Dark/Light Color Settings – Firefox will now match the dark or light theme you’ve chosen in your Windows settings to provide the perfect harmony in making you feel right at home. Siri Shortcuts for Firefox for iOS – Starting with today’s release, people can now open a new tab in Firefox using a voice command. This is the first of several shortcuts that will be added in the coming months. For developers, we’ve got tools to help you in the latest release. Visit our Hacks blog post for more detailed information. We’re continuing to work hard in delivering the features to give people greater control while on the web. Watch this Mozilla blog for more updates in the coming months. In the meantime, check out and download the latest version of Firefox Quantum available here. For the latest version of Firefox for iOS, visit the App Store.